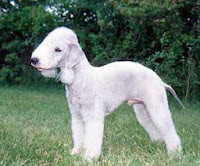 The Bedlington Terrier is an English breed, developed in the early 19th century. The name comes from the Bedlington Mining Shire, where the dogs were used to dispatch of vermin. These dogs are known to be mild and gentle with their family, and they generally make good playmates for children. They are extremely fast runners, and need to be taught a good recall. It is not a good idea to let them off leash unless in an enclosed area. Bedlington Terriers can get along fine with cats and other household animals if taught at a young age. Just be aware that they were once bred to be hunters, and this instinct remains. They are small dogs, usually between 18 and 23 pounds, but has been used to hunt both badgers and foxes. When it comes to grooming, the Bedlington Terrier sheds little to no hair, but requires trimming every six weeks. They can suffer from hereditary diseases, especially a liver problem known as Copper Storage Disease, but their average life expectancy is still around 17 years. We have seen this one on TV in dog shows. A very odd looking dog! How much does a cat sleep? Dogs and humans might have evolved together. Dogs suffer from stereotypes, just as people. Play a little every day!